On Sunday, January 15, at 3:00 pm EST, thousands of people from all walks of life gathered at 80 different sites throughout the United States – including Baltimore – to prayerfully Circle the City with Love. In a spirit of unity, interfaith clergy, community leaders and local residents held hands for 30 minutes of silent meditation to, “harness the power of love, peace, and justice our nation so desperately needs”. Circle the City was founded last summer by Sr. Rita Petruziello of Congregation of Saint Joseph in Cleveland, Ohio. In instituting Circle the City, it is Sister Rita’s endeavor to, “showcase the unifying and transformative power of love”. 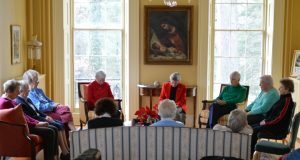 In Baltimore, prayer circles were held at several locations, including the School Sisters of Notre Dame, Baltimore Province, and at the Notre Dame of Maryland University, Noyes Alumnae House. A dozen people were on hand for Circle the City with Love at the Noyes Alumnae House on North Charles Street, including Sister Kathleen Feeley, SSND — the former President of Notre Dame College. Sister Kathleen told the Baltimore Post-Examiner she was pleased to have the opportunity to participate in the nationwide prayer circle. “Oh, I’m so happy that we’re doing something as a huge group to beg God to bless this country with leadership and peace. That’s why I said I’d like to get a group here at the Noyes Alumnae House. This prayer event was already planned, and all we had to do was buy into it on our own turf. Sister Kathleen said that along with the half-hour of silent prayer from 3 -3:30, her group would fellowship briefly before returning to offer additional prayers and petitions. “My feelings going into this prayer service? I want peace in the world. “It’s heartbreaking to read the news, and the whole Middle East situation; the Syria situation. Children growing up that have never known anything but war their whole life. 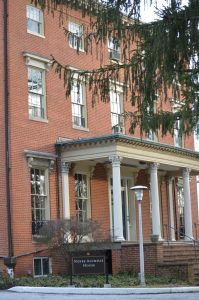 Editor’s note: This is the fourteenth part of an ongoing series which will look at the places and people that make up the rich history and diverse nature of spirituality, belief, and observance in Baltimore and beyond. Read the series here.